Hi! K9OT and KB9LIE are two ham radio operators from southwest Wisconsin, USA. Paul K9OT dreamed of vacationing on the French islands of Saint-Pierre and Miquelon with a contest added in. The islands are located off the southern coast of Newfoundland, Canada and count as a separate DXCC entity. Peg KB9LIE said, "Let's go!" In 2011, for our eighth visit, we will just use the call FP/K9OT. We plan on driving to Sydney, Nova Scotia and taking Air Saint-Pierre to St. Pierre, then enjoying a ferry ride or short flight to the island of Miquelon. Our destination as always is ham-friendly Motel Miquelon (formerly Maxotel), once again using Room 5. We also plan on attending the Maritime DX Forum in Halifax on the trip back home. We mainly use wire vertical antennas and 100 watts, due to Air Saint-Pierre baggage limits. We do CW and sideband only, with 80-10 meter capability. Main bands are 40, 30, 20, and 17. We will participate in the RSGB IOTA contest as a multi-operator/mixed-mode station. Please point your beams towards FP for a nice multiplier! Paul K9OT will be using his Yaesu FT-890 AT travel radio. He runs CW and is in charge of radios, antennas, 6 meters, and sightseeing. He finished his FP/WAS in 2006 and is working on his FP/DXCC. Paul was first licensed in 1986 as N9FVN. In real life, he is a commercial sheepfarmer.and runs a small-engine repair shop. of logging (DX4WIN and N1MM), publicity, and this web page. She takes her faithful Yaesu FT-900 CAT as always. The backup rig is an IC-7000. She finished her FP/WAS in 2004 and has 94 entities confirmed for her FP/DXCC (out of 115 worked so far). Peg was first licensed in 1995 and is a department secretary with the University of Wisconsin-Platteville. She has about 50 Katahdin hair sheep. You can QSL FP/K9OT via the homecall . One current IRC is fine, or one greenstamp or euro. Buro cards are welcome. Direct cards received without sufficient return means will be sent back via the buro. E-qsls will NOT be acknowledged. Thanks to all who have worked us in past years. Direct cards go out regularly and we are always working on buro cards. Henry Pollock K4TMC at The Mast Company supplies our aluminum masts. The new guy rings come in very handy. He also carries telescoping fiberglass poles, base insulators, and pivoting bases. UX5UO does a fantastic job with our QSL cards! We hope to have internet access on this trip but can't promise. Peg's full logs and Paul's contest logs are available on Club Log and LOTW. Because Paul usually logs on paper outside of contests, we can upload those QSOs on request when we are at home. To Jean-Pierre FP5CJ for being our local contact, and to Eric KV1J for sharing his expertise so generously. 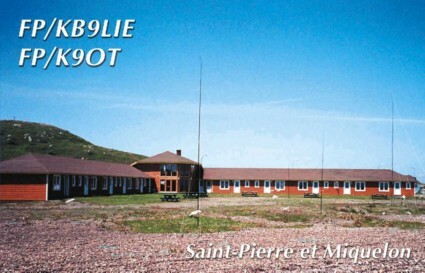 Eric is planning on operating from Miquelon this fall for the CQWW SSB contest.